From the Holonet is a series of articles, opinion pieces and features taken from the Old Republic and printed here on TOROZ. In Imperial society, power is truth. Sith principles guide the Empire to new heights with every passing hour. It is a simple and proud example of our principles, to watch those with ability break their chains and achieve what others could never do. Recognition of power and authority is one of the cornerstones of the Empire, and why the Empire is destined to win. As we all know, the Republic unrelentingly gorges upon its citizens’ tax credits and wastes them on woeful projects such as the doomed Taris reconstruction. Such endless expenditures drive good Human citizens into poverty, so that Ithorians and other aliens might live in luxury on a getaway planet, fulfilling their whimsical dream of growing plants. Such an institutionalised tragedy is not matched in the Empire. Money is spent on the military, which brings more wealth to its people as well as protects what wealth it does have. Those individuals most worthy and most able invariably obtain the wealth that they deserve. The Imperial political system is also superior. In it, those most capable and most powerful obtain more power. This is a system where promotion is granted on merit, not on mercy. In the Republic, a so-called democracy, the brutal rule of the unintelligent masses shackles and weighs down the brilliant few. While capable Republic people are stuck fulfilling the demands of the incapable masses, Imperial brilliance is rewarded and promoted within the system. The incapable minorities are driven to achieve well above their station, as directed by the most capable. In almost all cases, that is the Sith. Within the Empire, the actions of a Sith Lord who steps into command of a military affair and subsequently succeeds is not only permitted, but encouraged. In the Republic, it would be looked down upon, perhaps even punished. In the Republic, the Senate is the primary political force. Senate committees, subcommittees, debates and votes take an incredibly long time to get anything done. They are also so complex as to be hidden from sight. Corruption within the Senate, like the Republic, is common and ugly. The Empire has the Dark Council. The most powerful and most worthy Sith are empowered to make decisions. Without the delays and the intrigue of the broken Republic political system, the Empire is able to make decisions quickly and implement them effectively. The Senate is caught floundering and failing to keep up with the Dark Council. One merely has to look at their mishandling of the Treaty of Coruscant. Distinctly unpopular with the Republic’s most able individuals, Master Satele Shan and General Garza among them, Senate grumblings and Alien votes prevent its overturning. Instead, the Republic continues to bow in deference to a humiliating treaty, surrendering huge amounts of territory and enforcing complex conditions upon themselves. The Empire would never have subjected itself to such a thing, for they are powerful, independent and free. It is for these reasons that victory must go to the Empire. Every planet claimed for the Republic, is another planet to be weighed down by democracy, by alien rule and by wasteful spending. Every planet liberated under the Emperor will find its potential unleashed, and its most capable citizens will soon flourish under the glorious banner of the Imperial forces. The galaxy cannot afford Republic rule. Its people cannot afford it. There is too much talent, too much power and too much potential wasted within its borders. Only the Empire can bring the worthy to power, and only the Empire can liberate the people of the galaxy. Jacena Azana is a Human with a strong background in the Empire. Though she cannot discuss her former employment, she now works as a journalist and writer for the Hutt-owned, completely neutral ‘Evening Star News Network’. 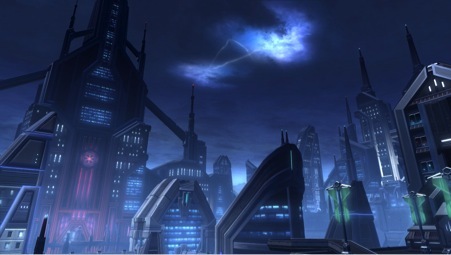 Azana routinely publishes pieces on intergalactic politics, the Empire, and the Republic. Her hard hitting firebrand journalism is widely read in all corners of space. The advantage that the Republic has – We know we win. 25,0000 odd years of continuous existence VS a footnote in history in 3500 years. There is a huge gap in the timeline here. For all we know the Empire might win, hold control of the galaxy for however long, and then somehow come to be replaced with another Republic. In fact, in episode… 2… I think… palpatine says “I will not let this Republic which has stood for 1000 years something something.” At least I think it was 1000 years. Either way, he sure as hell says less than 25,000 years. That stands as proof that this Old Republic does not survive to become the Republic of the prequels. I never claimed it would ‘pretty’. But France did eventually land on the winning side. The problem with the Republic is it’s weighted down by the pathetic refuse that they insist on ‘protecting’. By letting their sentimentality dilute their resources, they doom themselves. Evolution will out. The strong always crush the weak. Empire forever! StarWars like most games, requires perpetual conflict, sometimes the stories and reasoning for them can seem horribly contrived – thanks for your creative work.